Click Pic for Info STUFF"
This page is your place for Rumely Tractors & Equipment. Rumely tractors (to some), are a rare breed. They have a lot of history and....in our day and age, are a work of beauty when done up right! To see a perfect example of one of these along with a pretty neat story, click on the small "thumbnail" image above. and we'll see it gets attention.......Just make sure to include the word "Rumley" in the subject line! Odie’s Rumely Collectibles - Good page for Rumely stuff! John Ford's Rumely Tractors Page - A great Rumely Tractor Site for "The Greatest Tractors Ever Built": Site with a good selection of Rumely Photos. Chris & Rod Epping's Rumely and Other OLD Tractor and Gas Engine Homepage - Lots of Rumely Info and Connections. Jeremy Fiorelli's Huber Tractor Home Page - Good information & Links to Huber Stuff! Field Of Tractors - A great new tractor parts site grouped by tractor brand. Check it out! Iron Age Magazine - Covers steam and kerosene engines from the 1800's thru 1930's like Case, Rumely, Avery, Minneapolis, Advance, Russell, Huber, IHC, OilPulls. Rumely Products Collector's Inc. Home Page - Web Site dedicated to help preserve and promote the history of the Rumely Company. Complete Advance-Rumely Serial Number List - Real Good Info on Rumely S/N's. 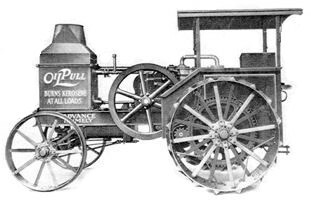 The Rumely Oil Pull Tractor - From Wikipedia, the free encyclopedia. Rumely Oil Pull Facebook Page - Enjoy!